Temporary informalization of urban space in global cities can radically alter interaction between urban citizens. Can we draw parallels between informal housing settlements in the global south and the Occupy Movement? 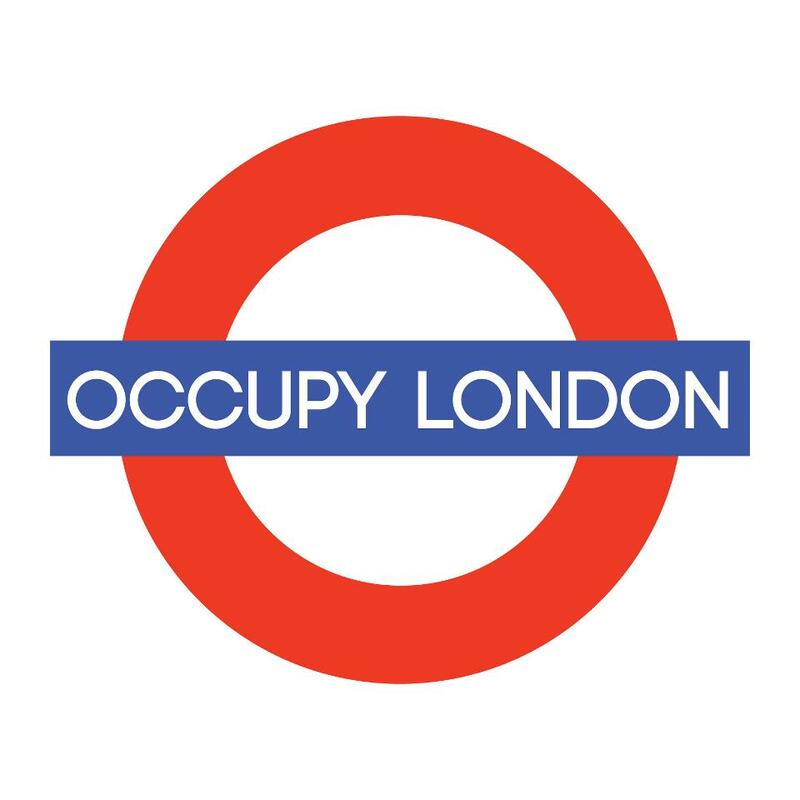 Following Lubaina’s post on the current urban occupations as protest, I too will blog about the importance of the Occupy movement, paying close attention to its informal nature. But I do not think such a discussion is wholly separate from those fostered on FAVELissues. Beyond the implications of the growing economic divide in the United States and Europe and beyond applauding the protesters for adopting a ‘right to the city’ framework, I think we can draw parallels between the occupations in the Global North and informal housing settlements in the Global South. Urban informal spaces in the form of favelas and shantytowns tend to produce socio-spatial relations distinct from those of the formal city. Government sponsored projects that benevolently attempt to integrate or formalize slum-housing settlements often change the way people interact with each other as well as with the built environment. Sometimes these changes constitute project goals and other times they are unintentional. Adriana’s recent post on the aerial cable cars in Medellin revealed that residents identified the new transport system as having a negative impact on their daily lives. While the steep climb up the hills of favelas and slums are physically taxing, they also tend to foster basic human interaction and community; see for example Kirsten Larson’s post on stairs (and lack thereof) in São Paulo. In London, New York City, Barcelona, Santiago and hundreds of other cities around the world, protesters are making public spaces, and in some cases private spaces, informal. These processes of informalization of the city, be it temporary or indefinite, reproduce socio-spatial relations distinct from those previously fostered by the very same spaces. We should not overlook these new spatial relationships. In the face of increasingly violent State-repression, they may be some of the most important results of the occupations. 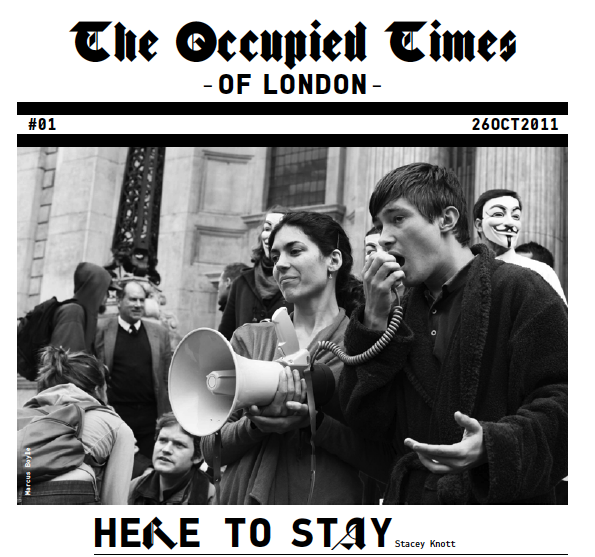 Front page of the first edition of “The Occupied Times of London”. ‘Here to Stay’ represents an important shift towards permanency in the discourse adopted by the protesters. 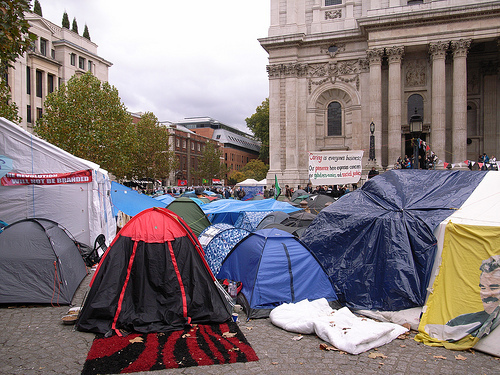 A couple weeks ago I attended a talk by David Harvey at the Occupy London Stock Exchange (OLSX) encampment at the famous St. Paul’s Cathedral (embedded below). Harvey sees the tent cities as the reclaiming of urban space by ordinary citizens, the making of the commons. Such a perspective understands physical resources (land, naturally occurring elements etc…) and social resources (space, knowledge, cultural assets etc…) to be held and administered collectively. Resource allocation and conflict are resolved through direct negotiation between individuals rather than controlled by government institutions or private corporations . Radical as this may sound, especially if we take it to a large scale, it is an idea being implemented at many of the encampments. Indeed, the protest movements have not offered ready-made sound bites of their demands and campaign platforms to the sensationalist and impatient media because they are busy experimenting with new forms of democratic governance. During Harvey’s speech, one man (we’ll call him William) began to drunkenly shout unintelligible obscenities while staggering through the audience seated on the cathedral steps. The interruption was an annoying distraction, but the audience’s response was as memorable as Harvey’s speech itself. Those closest to William patiently shushed and asked him to sit down until a young woman got up, took him by the hand and invited him to join her and her friends. His grumpy malcontent melted as she began to detangle and braid his long hair. William is one of several homeless people who have become something of a staple at the OLSX St. Paul’s camp. Within weeks of establishing the ‘tent city’, the general assembly had decided (using the consensus decision-making process that has become something of a standard at the occupy camps world-wide) to pitch a tent that acts as a “welfare center”, catering to the specific needs of homeless individuals and staffed by volunteers and specialists. A number of donated tents have also been designated as sleeping space for homeless persons. The braiding of William’s hair was as ordinary as it was remarkable. Homeless citizens are the subject of scorn and violence, but mostly they are purposefully ignored by the average pedestrian. Before OLSX set up at St. Pauls, most folks would have ignored William had he shouted at passerby on their way to work or touring the city’s historic center. Perhaps if he had caused enough of a disturbance, the police would have intervened and intimidated him into leaving the area. In contrast, within occupied space being collectively used by the public, William’s interruption did not go ignored or policed. There was a very quick ad-hoc negotiation that ended in warm and kind human interaction (a rarity for most homeless folks). Since then I have seen William twice more at OLSX, once in the tea and empathy tent and another time helping to clear dishes in the communal kitchen (where all are welcome to eat for free). Both times he was smiling and making jokes. I am not advocating for tent-cities as the solution to homelessness, nor do I offer the above example to characterize the OLSX camp as a whole. My goal is to be conscious of the radical social changes that are engendered at the micro level in these new spaces, both in the way the camps are governed and in how their inhabitants and visitors negotiate and problem solve. Examples range from the treatment of the homeless to voluntary cleaning of the plaza, to the allocation of thousands of pounds in donations. I think such changes have been made possible only by the informalization of the formal city. Urban planners, architects, activists and community advocates working in informal housing settlements might learn from comparing processes of slum-integration and the informalization of the formal city. We should recognize that not all consequences of informality are negative, and that certain integration strategies unintentionally inhibit the reproduction of those positive community relationships. Moving forward, we may design new strategies that improve the infrastructure and social services while maintaining those positive aspects characteristic of the informal.